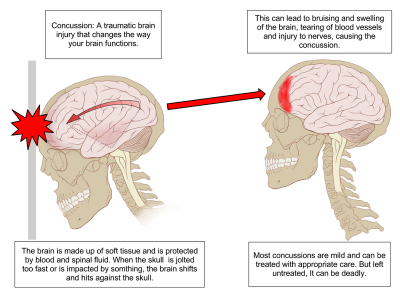 A concussion is a temporary disruption of brain function caused by head trauma. While people might think a concussion can only occur if someone is knocked unconscious, mild concussions can happen without ever losing consciousness. Because of this reason, it is important to be vigilant in checking for symptoms after someone suffers head trauma, no matter how mild. Some people with concussions feel normal after a few hours, but others can have symptoms for weeks or months. If you have suffered an injury to the head, it’s important to seek medical attention as soon as possible. Early detection and treatment are essential for the recovery process because it may reduce the risk of developing long lasting side effects. At FastMed Urgent Care, our goal is to get you in and out within an hour, starting your road to recovery in no time. Our experienced medical professionals are dedicated to providing the highest quality to care to everyone who walks through our doors. We are open with extended hours 365 days a year. If you get injured on a weekday, weekend, or holiday, FastMed will be there to help.